As composer John Joubert approaches his 90th birthday, he’s delighted at the prospect of hearing his labour-of-love opera performed. 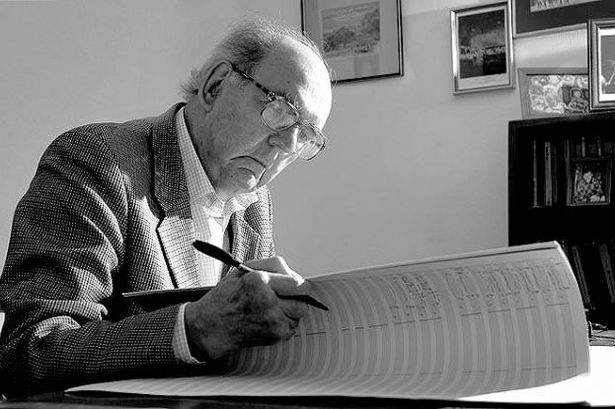 As his 90th birthday approaches, John Joubert can at last look forward to hearing a professional performance of his life’s labour-of-love opera Jane Eyre, composed unusually without commission, and several decades in its gestation. Am I right in thinking this is his seventh opera, I ask the composer in his comfortable Victorian home in Moseley? “I’ve never actually counted them, but I think seven is right!” he jokes. He goes on to recount how he came to love opera, first when he came to London in 1946 from his Cape Town birthplace on a Performing Rights Society scholarship to the Royal Academy of Music, subsequently on his move to a lectureship at the University of Hull in 1952, and eventually when he settled at the University of Birmingham in 1963. Literature has always formed a major part of John’s compositional inspiration, I suggest. “One of the things I became very firmly involved in was Stravinsky’s The Rake’s Progress, which rapidly became one of my favourite operas. I was amazed how he treated the ancient form of opera – recitative, aria, ensemble – and used it in a modern style, in a personal style, and it seemed to work so brilliantly! In addition to the Stravinsky, John has told me of his love for Wagner and Verdi, but who else has been his operatic mentor? What was it that attracted John to Charlotte Bronte’s Jane Eyre? The ending of the opera is magical, but isn’t there a question-mark at the end, in the layout of the concluding chord? “Oddly enough, I was thinking about that the other day, and yes, I think there is. The remarkable thing is that at the beginning of the novel Rochester isn’t a very nice person, a bit of a cad, really. He treats Jane very badly, but at the same time is very attracted by her. “She, on the other hand, she is a very early feminist, she wants to find work and be accepted. Though there are big differences between each other, they nevertheless fall in love. And the question mark at the end is, I think, it’s not very much emphasised, but that it’s just suggested that this is not the end of the story, that she’s taking on something really big. When this forthcoming concert-performance was mooted, John went back to his score of Jane Eyre, and realised that some of the material in the scenes, as well as orchestral interludes between the scenes, was superfluous to the action. He decided to make one event central to each scene, and actually cut 45 minutes’ worth of music. He modestly adds that the discarded orchestral interludes have now formed the basis of a new work, his Third Symphony. “I call it Third Symphony on themes from the opera Jane Eyre. “There was a time that I thought I’d never live to see the opera performed, and so I composed a piano Fantasy upon Themes from Jane Eyre, and I think material from the opera has appeared subconsciously in other works. * John Joubert’s Jane Eyre is in concert performance by the English Symphony Orchestra and soloists, Kenneth Woods the conductor, at the Ruddock Performing Arts Centre, King Edward’s Schools, Edgbaston Park Road, Birmingham on October 25 (pre-performance talk 6.30pm, performance 7.30pm). It will be recorded live for CD release on the SOMM label in March 2017. All details on 0121 472 9585.